Lockheed Martin has completed the initial delivery of a new search-and-rescue aircraft to the U.S. National Guard. 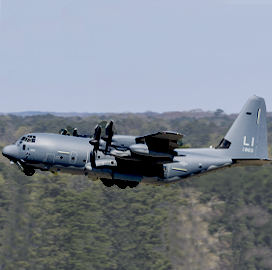 The HC-130J Combat King II aircraft is the first of four to be delivered. The National Guard's 102nd Rescue Squadron will operate the aircraft from Francis S. Grabreski Air National Guard Base in New York, the company said Thursday. The HC-130J will be used to refuel the Sikorsky-made HH-60G Pave Hawk helicopters belonging to the New York Air National Guard. The fixed-wing platform is designed to perform airdrop, airland and air-to-air refueling in austere conditions. The aircraft is also expected to be used in disaster response and humanitarian missions. The U.S. government is using C-130J variants as common recovery aircraft in the U.S. Air Force, the U.S. Marine Corps and the U.S. Coast Guard.